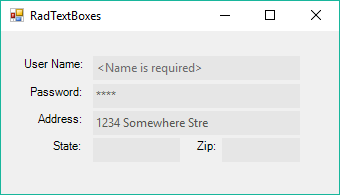 RadTextBox is a themeable alternative to the standard Windows Forms text box control. It allows you to include a text box in your applications that is consistent in look and feel with the other Telerik UI for WinForms controls you use. In addition, it allows the developer to set a default text to be displayed when there is no actual data in the text box.